Now, we should all know the young man in this image. 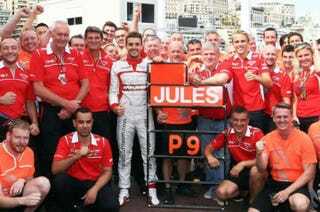 His name is Jules Bianchi, and he currently lies in a coma in a French Hospital. His career was ended at a Japanese Grand Prix last year. Not since Ayrton Senna had a grand prix driver suffered an accident so horribly during a race. He hit a crane that was removing Adrian Sutil’s car from the gravel trap it was stranded in. After that accident, the F1 world rallied once again towards safety, the largest push since the Sainted Professor Sid Watkins led his charge after seeing his friend Ayrton die after a massive wreck. Now, some fellow F1 writers have been calling for F1 to return to a “Rebel Yell” of political incorrectness and danger. Here’s why this is wrong.